The United States has depended upon offshore resources throughout its history. 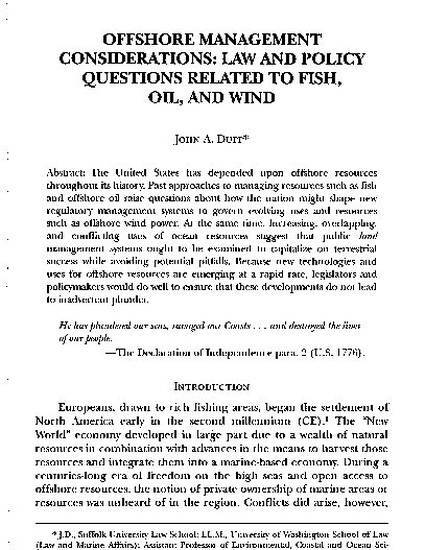 Past approaches to managing resources such as fish and offshore oil raise questions about how the nation might shape new regulatory management systems to govern evolving uses and resources such as offshore wind power. At the same time, increasing, overlapping, and conflicting uses of ocean resources suggest that public landmanagement systems ought to be examined to capitalize on terrestrial success while avoiding potential pitfalls. Because new technologies and uses for offshore resources are emerging at a rapid rate, legislators and policymakers would do well to ensure that these developments do not lead to inadvertent plunder.